Sushi Go may not have the heft to keep less casual gamers interested but it has an approachability that is off the hook, yo. We gave it three stars, acknowledging that while it’s not a particularly deep game, it’s one with its own significant charms. One of those charms is the claim anyone can play it. WELL, CAN THEY? Let’s chow down and find out! Colour blindness does have an impact on how easily identifiable particular dishes are at a glance, but it doesn’t get in the way of playing. The only thing that’s likely to be at all affected is your ability to take in the general proportion of particular dishes held in place by your opponents. Otherwise, everything has its own distinct artwork and identifies its type along the bottom. We strongly recommend Sushi Go in this category. Bright, vibrant colours are used to identify different kinds of sushi – red for maki rolls, blue for dumplings, pink(ish) for tempura, and a kind of ‘off orange’ for the various kinds of nigiri. This helps significantly in allowing those with visual impairments to meaningfully identify both what cards they have in front of them, and what cards are in front of their opponents. Each of the cards too has the name of the dish along the bottom in what looks to be about an 18pt font. That’s nice. The contrast isn’t always great, but this is offset to an extent by the fact every piece of food has its own distinctive art. It might be a little tricky to identify specifics of wasabis and nigiris at a distance if trying to assess what’s likely to mess up your opponents most in drafting. In that situation though the only thing you really need to worry about is if they have an unused wasabi on the go. You can ask, although it does give away some game state information regarding your intention. It’s far from a deal-breaker though, since once a card is played there’s no opportunity to remove it from consideration, and little ability beyond drafting what you think are key cards when they arrive in your hand. Mostly what you’ll be doing there is trying to block the incremental play of sashimi, puddings and dumplings and these all have a distinct colour palette that enhances their visibility. 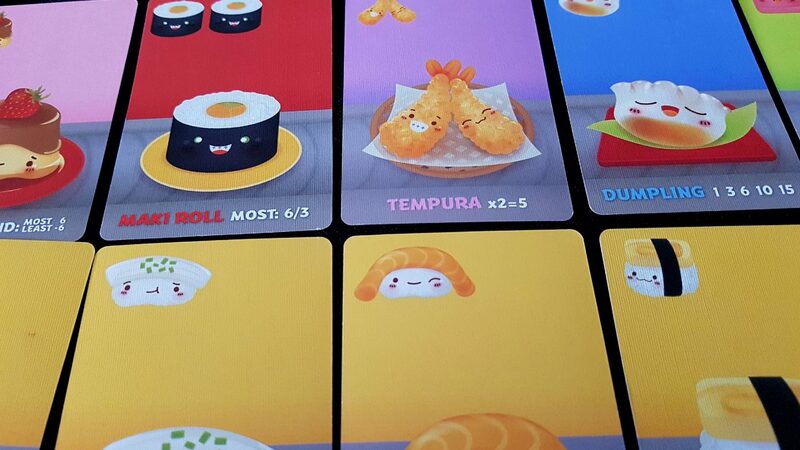 As it’s a card game, there’s no tactility of individual dishes so if a player is on the extreme end of the visual impairment spectrum it is likely Sushi Go will remain obstinately inaccessible. However, for more moderate considerations it’s likely that players will be able to meaningfully participate in the game without too many troubles. As such, we recommend Sushi Go in this category. 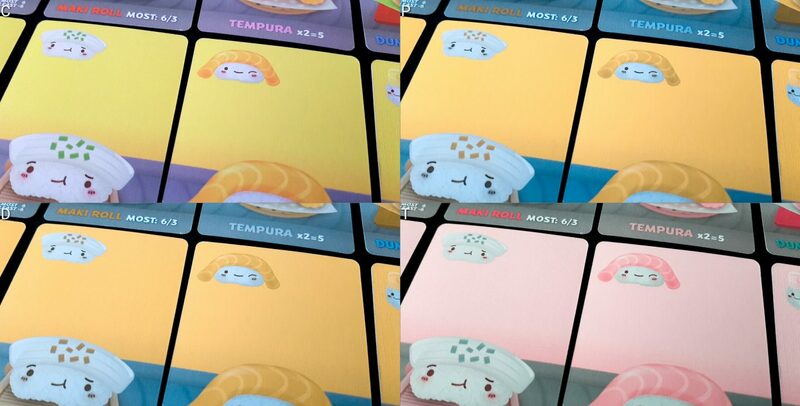 There is scope in Sushi Go for skillful players to hold in their mind the approximate (or even precise) state of all hands as they orbit the game. Being able to do this yields a considerable gameplay advantage as it more precisely focuses the mathematics of probability into increasingly accurate windows. It’s not critical to play, but it’s useful for consistently good play. The extent though you’ll be able to take advantage of such mental state modelling is limited by the number of people playing, and how long before you see your hand come back to you. Whatever happens, you’re just picking a card from an ever decreasing supply – picking the best one is a function of the motivations of everyone around the table, but picking a good one can just be down to what you yourself are doing, and what is visible in front of everyone else. If you know the player to your left has two sashimi, you don’t need any great leap of memory to think ‘so, I better deny them the one in this hand’. A good memory then is helpful, but you can still have fun playing without it. While you don’t have all the game state in front of you, you have enough to make meaningful decisions. Even this limited memory requirement can be obviated by simply playing all hands face up – after all, once everyone has sampled a selection they know what’s in the hand anyway. It would change the tenor of the early game, but it wouldn’t necessarily be to its detriment. In terms of fluid intelligence, the game has few areas of concern. A degree of numeracy is needed, but the set collection element is in itself satisfying enough to carry it through if you wanted to ignore scoring. An understanding of probability is helpful, but less helpful than you might expect – it’s something that makes players better, but doesn’t interfere with enjoyable gameplay. There’s no reading level required, since every card has its own art and colour palette. There’s no synergy of rules, little game state complexity, and only one incidence of decoupling your action from outcome (playing the chopsticks). For those players where numeracy is lacking but still present, the mathematics of scoring are relatively straightforward – they rely on a degree of addition and identification of multiples, but that’s it. There’s no reason why the scoring can’t be handled by another player, or through the use of one of the free scoring apps that are available. We’ll recommend Sushi Go in both categories of cognitive accessibility. The only two strong emotional triggers are the frustration of seeing a card you need disappear as an upstream player takes advantage, and the regret that comes from knowing that the card you just bought in the last hand is useless for the current one. Both of those are minor issues, although it is possible (and indeed, part of natural gameplay) that players upstream of you will ‘hate draft’ the cards they know you need. The only consolation there is that you’re very likely doing the same to them. There are not many opportunities to meaningfully gang up on players since there are no game systems that permit mutual benefit from doing so – you can deprive a player of their ‘most maki rolls’ score, but only in isolation. Nobody can add their rolls together. 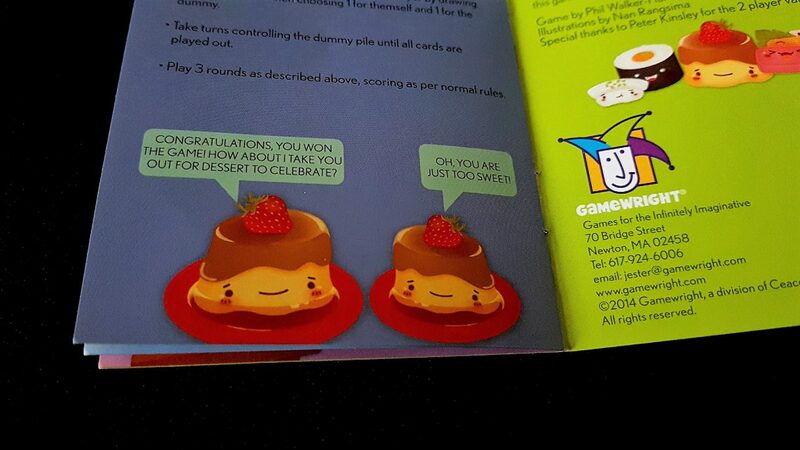 Competition overall is at best passive aggressive, and when it’s head to head it’s in terms of competing for ‘most puddings’, ‘most maki rolls’, or in terms of set completion. It’s rarely specifically directed, although it can be. Focusing on one player though leaves all the others free to undermine your efforts. Waving goodbye to a card that you realise too late you needed can be frustrating, especially if you end up committing yourself to a flawed course of action. You can’t undo your mistakes – when you draft a card, it’s yours until the end of the round even if you find out that you couldn’t have completed the set because there weren’t enough of the right card in the deck in the first place. You just have to make your peace with it. Overall though the game is so deeply charming, and so obviously non-threatening, that we’re happy to recommend it in this category. The drafting mechanic requires a lot of passing hands from one player to another, and if one or more players have physical impairments this won’t be ideal. Coupled to this is the fact that each time you’ll be given a sheaf of cards to choose between – you don’t do a lot of ‘in hand’ management, but you do a lot of intra-hand management. If making use of an accessibility aid such as a card holder, that’s going to involve an awful lot of fiddling about. This will be fine if physical impairments don’t relate to hands or arms. It’s going to be a problem if they do. Verbalisation too is a sub-optimal strategy for those that cannot directly manipulate a hand of cards. One option will involve a serious disruption of game flow as a hand is passed, arranged into a card holder, selected, and then collected up and passed on. All of that overhead is a critical problem in a game designed to play so quickly and smoothly. The other option will be for another player to hold both hands at the same time, or do their own and then that of a physically impaired player. That is less likely to involve serious disruption, but does rely on another player being willing and able to do it. We’ll offer a tentative recommendation in this category. There are workarounds for the card drafting if that is to be an issue, and it’s the only physical interaction required of play. The game does not require any literacy, and there is no communication needed during play. You can sit and stare at each other in angry silence if you like and lose nothing of the experience. The theme is adorable, the art is completely charming and inoffensive, and the very slim manual adopts gender neutral pronouns. There is nothing to complain about, which is a shame because I really enjoy complaining. At an RRP of £10 and a maximum player count of five, you get a lot for your money. This is the kind of cash outlay where there is little risk to simply buying and trying, especially given the age ranges it meaningfully supports. It’s playable by adults, and even by young children with limited numeracy. It fits easily into all kinds of game groups. 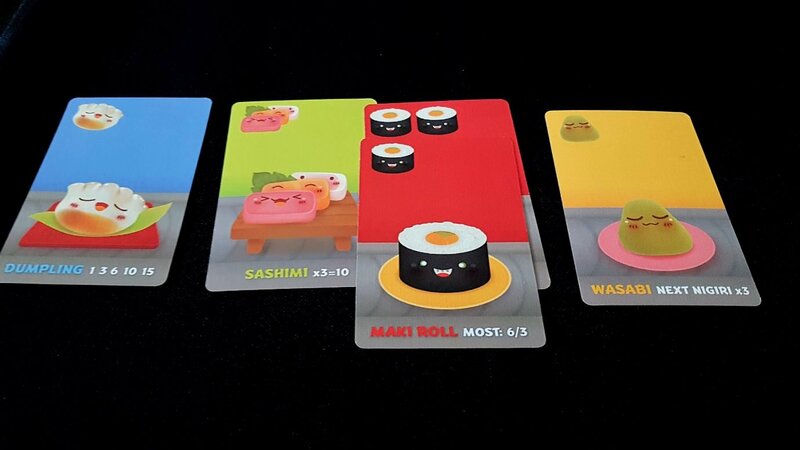 However, if you need something a bit meatier you might want to check out Sushi Party – it goes up to eight players. I haven’t played it myself so I can’t unequivocally recommend it. I would point you towards the Dicey Exploits review to see if you need the extra oomph it’ll give you. Sushi Go is very strongly recommended. For those players with visual impairments and colour blindness, meaningfully identifying the composition of played cards is going to be difficult. Together, this would be enough to knock the game out of a recommendation for either group. Similarly, while the game doesn’t require much in the way of memory, if memory impairments are compounded by visual impairments the game is going to be meaningfully more difficult to play. The compensation for not knowing when players have, for example, unused wasabi is to hold those elements in memory. If that’s not possible, then you’ll often end up giving opponents exactly the cards they need. That won’t be enough to ruin the game, but it will have a negative impact. If a physical impairment is compounded with a visual impairment, the sheer number of cards that need to be examined may also be an area of concern. Every turn you get a new set, and while they will revolve back into your hand over time they’ll arrive in a meaningfully diminished form. If you can bring assistive aids to bear on the cards for examination that won’t be a major problem, but if not then the game once again likely slides into inaccessibility. Hidden hands in games are often a problem for the intersection of physical/visual and cognitive impairments because players can’t get meaningful help from others without impacting on gameplay. In Sushi Go it is less likely to be a problem since the cards themselves are only scoring elements. None of them have complex effects or game rules that they influence. Some of the more complex scoring cards (dumplings for example) may require prompting if numeracy is limited or cognitive impairments are severe. Once you begin a round of Sushi Go, you’re in it for the long haul – you can’t drop out of play without bringing everything to a grinding halt. However, rounds are very quick – five minutes or so, barring the increases that accessibility compensation may mandate. There’s no need for a player that begins in round one to be present in round three, although there are some pudding considerations that would need to be resolved. 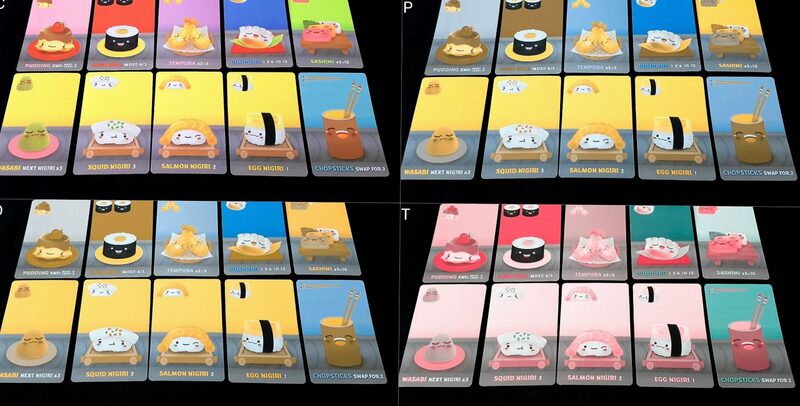 There are ten pudding cards in the entire deck, and they persist in a player’s ownership between rounds. Some form of pudding redistribution may potentially be necessary. However, three rounds of play are likely to be over in around fifteen minutes, and so even conditions with modulating levels of discomfort are likely to find this a feasible proposition for a game that is unlikely to exacerbate problems. It turns out, with some caveats, that Sushi Go is indeed a game that anyone can play! It manages strong results across the board, with especial commendation in the socioeconomic category. I’m a sucker for a game that comes in a tin. And also for one that gives me an opportunity to use the term ‘pudding redistribution’ without prejudice. The key ‘novelty’ in the teardown here is in the drafting mechanic, which puts a lot of stress on physical interaction. You’ll be constantly circulating ever decreasing decks between players, and then you’ll start round two and do it again, and then round three and do it yet again. That may not sound like much, but depending on what kind of impairments must be taken into account it’s a lot of stretching over a table and taking hold of cards. That can, in some circumstances, be a lot to ask. At three stars, Sushi Go doesn’t exactly set our hearts aflame – that’s surprising, given the fact wasabi is often a trigger for heartburn. Don’t let our contrarian view put you off though – there are a lot of people that love this little bugger. It’s currently, at the time of writing, Boardgame Geek’s #297 top game. If you like the sound of it, you’ve got very little to lose in giving it a go at the price-point it presents. As discussed before on twitter, it’s pretty sad that the Party ‘deluxe’ version is twice as much by you and DE, going off of the linked video. In the states, the Party ‘deluxe’ edition is pushed by reviewers more as it’s pretty much a 7 buck upgrade from the original version. Granted, Gamewright also thinks that All of Forbidden Desert’s components is worth being only set to 25 bucks. At least the original version is easier to store, Party can’t really go on its side too well, leading to scattered soy bottles in the box and tiles falling away from the cards they’re supposed to be grouped with. Even though it isn’t as economically inclusive and a bit more intimidating, Party does have a set with cards that require LESS errata/clarifications needed to be memorized by the person teaching the game. Oh, that’s neat – how does that work? I’m assuming it’s more ‘works with what’s in front of you’ than ‘works wth what’s floating around the group’? I am glad there is someone out there who is willing to do the hard work of breaking down and explaining each element of the game. I love eating Sushi so of course this game caught my eye. The artwork is cute and I happened to find your blog and I truly appreciate the effort you put into helping others make informed decisions as consumers. So thank you. Thank you for your kind words. I think of this in line with the old proverb – ‘it you love what you do, you’ll never work a day in your life’. There’s a certainly a lot of work that goes into these teardowns, but it’s too interesting (for me at least) to consider it ‘hard’.